Fonte: Adaptado de Martin, 2015. BLACKSTONE, E. A.; JOSEPH, P. F. The Economics of Biosimilars. Health Drug Benefits, v. 6, n. 8, p. 469-78, 2013. RAK TKACZUK, K. H. et al. Biosimilars in Oncology: From Development to Clinical Practice. , v. 41, n. 2, p. S3-S12, 2014. Suplemento 3. BERKOWITZ, S. A. et al. Analytical tools for characterizing biopharmaceuticals and the implications for biosimilars. Drug Discov., v. 11, n. 7, p. 527-40, 2012. MARTIN, K. European experience with Biosimilars. Santo, 2015. 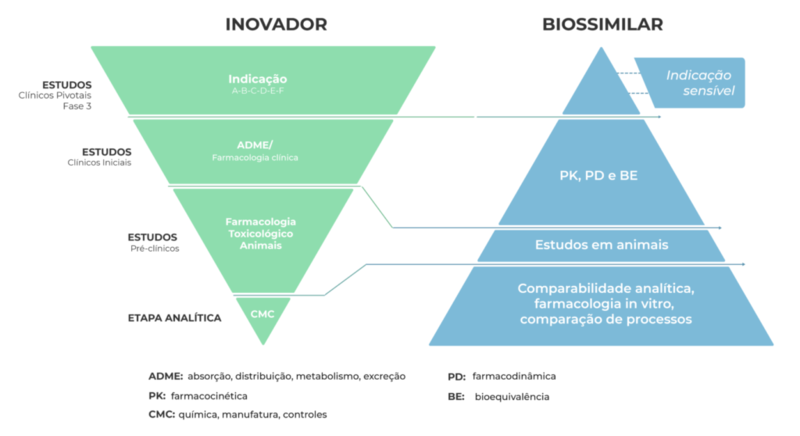 Disponível em: <http://www.santo.kz/en/doctors/publishing/european-experience-with-biosimilars/>. Acesso em: jul. 2018. ZELENETZ, A. D. et al. NCCN Biosimilars White Paper: regulatory, scientific, and patient safety perspectives. Compr. Canc. Netw., v. 9, p. S1-22, 2011. Suplemento 4. BENNETT, C. L. et al. Regulatory and clinical considerations for biosimilar oncology drugs. Lancet Oncol., v.15, n. 13, p. e594-e605, 2014. ALTEN, R.; CRONSTEIN, B. N. Clinical trial development for biosimilars. Arthritis Rheum., v. 44, p. S2-S8, 2015. Suplemento 6. KOZLOWSKI, S. et al. Developing the nation’s biosimilars program. J. Med., v. 365, n. 5, p. 385-8, 2011. RUGO H. S. et al. A clinician’s guide to biosimilars in oncology. Cancer Treat. Rev., v. 46, p. 73-9, 2016.